Nothing brightens up a room like a beautiful arrangement of flowers. 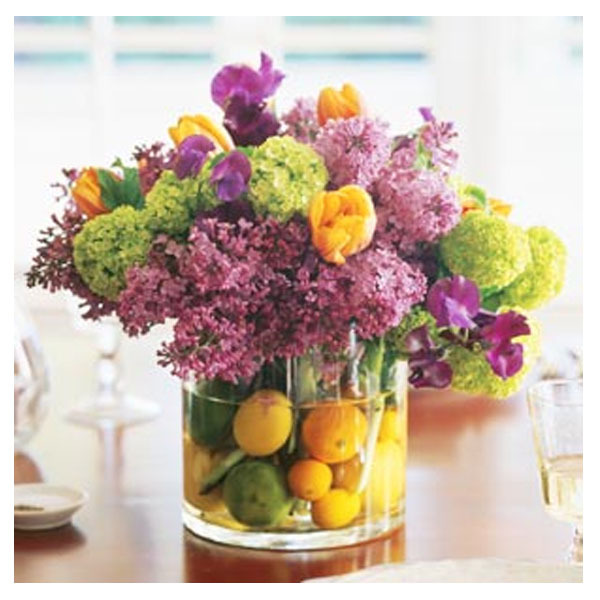 Add pretty spring flair to your home with our ideas for centerpieces. This bright arrangement of gerberas will look lovely as a table centerpiece, inside or out. 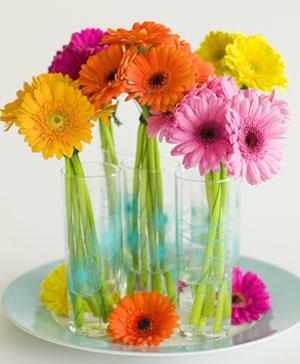 Tip: With plain glasses, you could add food coloring to the water to match the flowers. Set aside one gerbera in each color. Wind florists’ wire round each of the rest, starting at the top, and trim at the base. This stops them drooping. Join the gerberas together into five bunches of four all the same color, winding the string several times around the top to secure. Fill the glasses one-third full with water and put a bunch in each. Group the glasses on a large plate, and then sprinkle with the flower heads of the five you set aside. This striking arrangement is so easy to put together, can be ready in minutes and is ideas for the spring season. Tip: As you need very open flowers for this arrangement, you’ll be able to pick up a bunch quite cheaply. Half-fill the bowl or vase with water and stand the candle in the middle. Float the buds from a hyacinth head in the water. 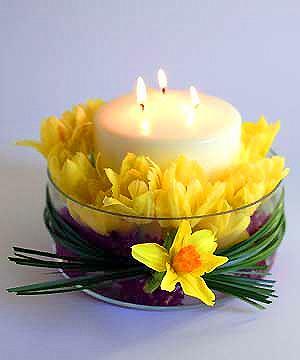 Cut stems of tulips and arrange around the candle, on top of the hyacinth buds. Finish off by wrapping the vase in bear grass and attaching a daffodil head at the join. Use florist’s wire to make secure. Using multicolored winter citrus fruits and the first blossoms of spring is all it takes to make an inventive centerpiece. You can reproduce it throughout the year with the hard fruits and flowers of other seasons. Choose a wide, low, clear glass vase or container, so that the arrangement will be stable and will allow guests to see one another across the table. Insert one type of flower; the largest variety first and a single stem at a time, pushing the stems between the fruits to firmly anchor them. Fill the vase two-thirds full with a variety of citrus fruits, such as oranges, lemons, limes and kumquats. Add water to come halfway up the sides of the vase. Add two or three other types of flowers in the same way at random intervals to round out the arrangement, creating a pleasing shape and a balance of color.